How can coffee husk help to fight poverty, improve sustainability and optimize performance? Coffee is the main cash crop in Uganda and is crucial for the country’s economy, accounting for 22% of total exports. It is estimated that up to 20% of the population earn all or a large part of their income from coffee. Geocycle partnered with the Uganda Coffee Development Association to provide high quality seeds and technical support. 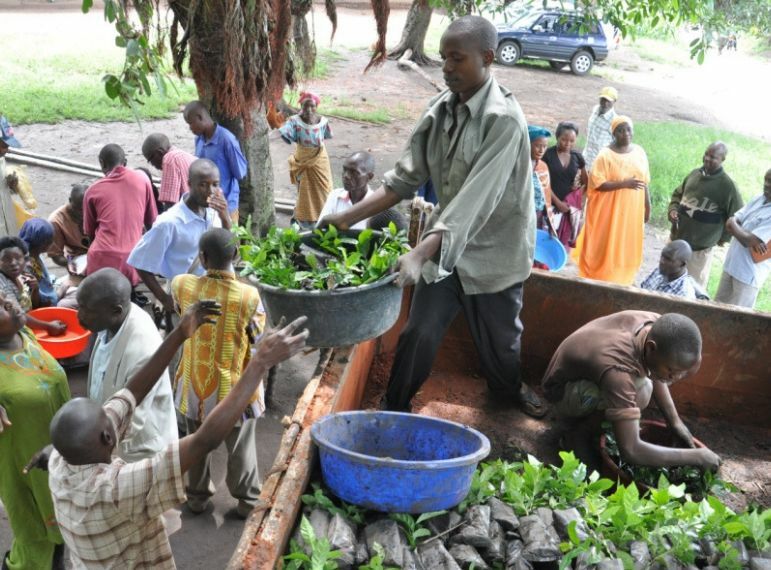 Nurseries were then set up through 3 farmers’ associations to produce the coffee seedlings. Once mature, the seedlings were provided to local smallholder farmers at 1/6 their normal price. The project met with great success, 45,000 farmers signed up and around 16.7 million coffee seedlings were distributed between 2012 and 2015, with resulting income to the farmers expected to total approximately CHF30 million by 2020. In addition to enhancing the livelihoods of local coffee farmers, the project helps LH Hima Cement plant to access renewable energy from coffee husk (biomass), which reduces CO2 emissions, while stimulating local economic growth and alleviating poverty.